Imagine being able to create a fully custom animated intro for your YouTube channel easily and for free, entirely online. Luckily, such a tool exists. 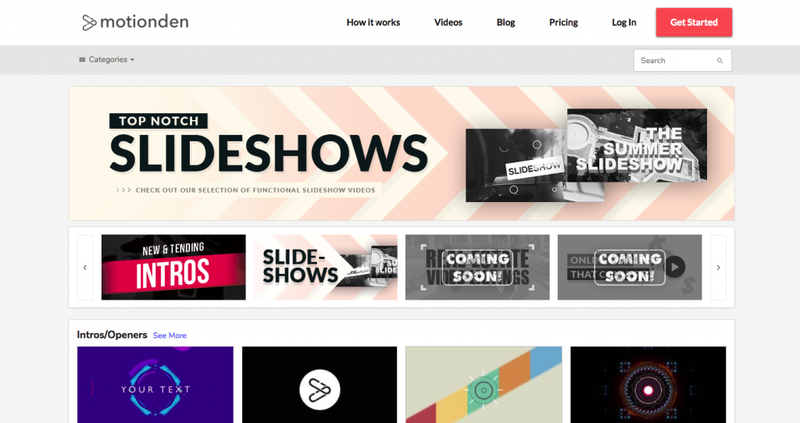 MotionDen is an online intro maker that allows you to do exactly what we’ve mentioned above. The old-school way to making an intro for your YouTube channel involved downloading big intro template files from websites like EditorsDepot, and editing them using complicated, expensive software like Adobe After Effects or Cinema 4D. Go to https://motionden.com and click on the Get Started button to sign up and browse the available videos. Don’t wanna sign up? You can still view our intro video designs without signing up simply by clicking “Videos” on the navigation bar. 3) Click “MAKE MY VIDEO” and begin customizing! Once you’re in the video editor play the video and click the customizable layers to add whatever text or logo you want and click the Make Video button. Afterward, it will prompt you to go to your Dashboard where you will be able to see the finalized videos. You can choose to upload them to YouTube for free, or pay a small fee to remove the watermark or subscribe to a monthly plan for multiple videos. First impressions matter, and as a content creator you want every aspect of your video to be the highest quality it can be. Having a resource like MotionDen will allow you to do just that while also saving you time and headaches. If you want to remove the watermark, it will cost you a small fee. The good news is that it’s super affordable. You can pay a couple of dollars and download the video OR for the price of a large pizza you can get the basic subscription service to make multiple video intros which is the best option if you’re an aspiring YouTube content creator. In conclusion, among the many different ways you could get a professional intro for your YouTube video, MotionDen remains the easiest to use and the most affordable resource.